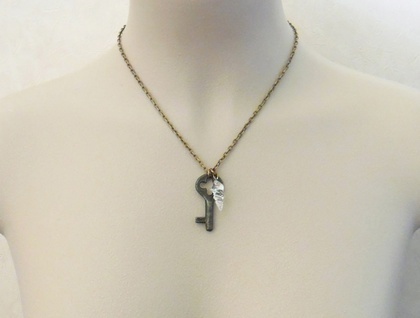 This necklace features a tiny, vintage unicorn horn charm made of glass, and an old, unusually shaped key. 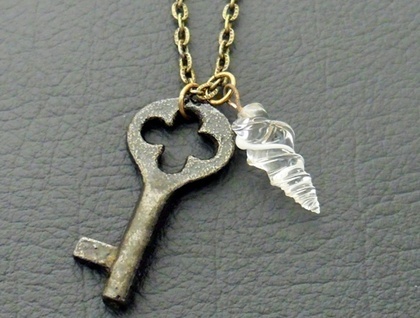 The little alicorn (unicorn horn) is a vintage charm, handmade from clear glass with a white streak, with a brass wire loop at its top for hanging. Like all old things, it should be treated gently. 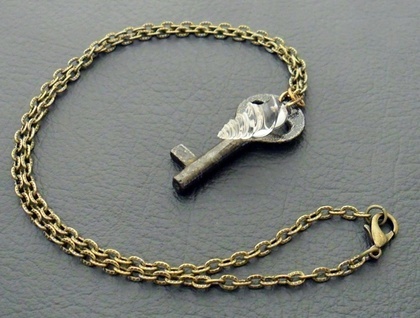 The key is very old, probably vintage or perhaps even antique (100 years old or older). I have sealed it to preserve its aged look and to prevent any rust or tarnish from spreading to your other jewellery. The chain is iron based and coloured antiqued bronze, and has textured, oval links. The necklace fastens with a matching lobster-claw clasp. 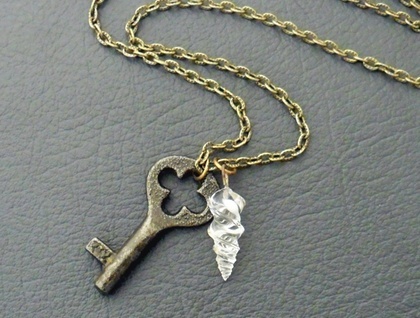 'Alicorn And Key' is a unique, one-off Silverlight Jewellery design, never to be repeated. The chain measures 46.5cm, including the lobster-claw clasp. The old key measures 39mm from top to bottom, and 19mm across the bow. The alicorn is 21mm long, not including the brass wire loop, and 9mm across. To clean this necklace, wipe it gently with a damp cloth, or give it a bath in warm, slightly soapy water. Dry it immediately in sunlight or with a hairdryer or some other source of warm (but not hot) air. For shipping and returns policies, and other information, please see the 'about' link on the left.